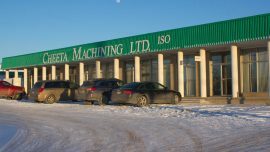 Gemini Machine Shop Management & Consultants Ltd. was founded by Herb Neitsch in a 1,500 square foot industrial condominium bay in Nisku, AB. Acquired more manual equipment and grew into a 3,000 square foot industrial condominium bay. Acquired more manual equipment and grew into a second 3,000 square foot industrial condominium bay. Herb’s shares were acquired by his son, Chris. Acquired more equipment and grew into a third 3,000 square foot industrial condominium bay. 3 acres of land were acquired within the East Industrial section of Nisku. Gemini built a new 15,000 square foot facility and moved from the industrial condominium bay location. Gemini purchased a significant amount of new manual & CNC machining equipment. Gemini purchased new, state of the art, CNC turning & milling equipment. Gemini purchased new, state of the art, welding & fabrication equipment. Gemini began a 30,000 square foot expansion. Gemini launched its internal ISO 9001 Quality Management System. 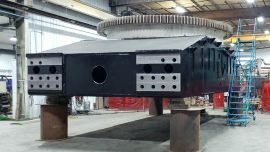 • Chris repurchased 100% of Gemini shares back from Diversity Technologies Corp.
• Gemini purchased new, state of the art, line boring equipment. • Gemini purchased new welding & fabrication equipment. 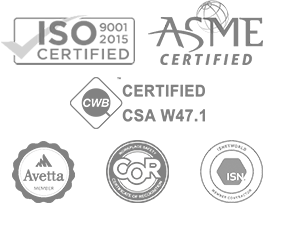 • Gemini obtained WCB COR certification. • Gemini obtained CWB Welding certification. • Gemini obtained ISO 9001 QMS certification. 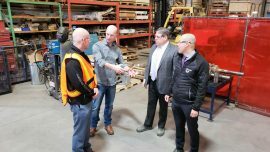 • March: Gemini celebrates an exclusive agreement with China headquartered Kana Energy and SJ Petroleum as their authorized Canadian drilling rig, workover rig, and equipment service provider. 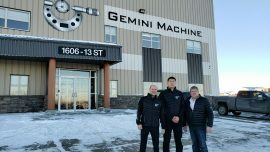 • November – The first rig is shipped from SJ Petroleum’s China based facility and received at Gemini Machine Works in Nisku, Alberta. • December – Under the direction of Kana Energy, the first rig from SJ Petroleum is fitted to North-American standards by Gemini Machine Works, set up, and tested for use by Shell Canada. • January – Shell Canada receives the first completed rig package from the Gemini Machine Works, SJ Petroleum and Kana Energy partnership. • July 31 – Gemini Machine Works acquires McKinney Machine, increasing Gemini’s product list and service capabilities.